It’s 11 years old now. Brewfest, the in-game holiday loosely based on Oktoberfest, is back outside Ironforge and Orgrimmar. Personally, I think Alliance get the better looking of the two places. It just feels more of a celebration of beer and food when it’s pitched by dwarves. In years’ past, we got colored steins. (I still have all mine. Do you?) Then we got heirloom scabbards which increase a weapon to, now, 110. There are also toys, battle pets, and two Brewfest mounts — the Swift Brewfest Ram, and the Great Brewfest Kodo. The holiday boss, Coren Direbrew, drops trinkets and you can take any toon from 40 upwards into his encounter. He’s an easy queue from your dungeon panel. Remember, you only get loot once per day, per toon, but it’s a fun fight and very easy to do. I had my bear tank him last night. What’s new this year? Nothing. That’s kind of sad because it would have been nice to tie in the Dark Iron race to Brewfest beyond them showing up to disrupt the place. As forum commenters have pointed out, Anduin was kind enough to let High Warlord Saurfang out of Stormwind Stockade to tap the keg in Orgrimmar. If you’re leveling, it’s worth being there when he does it because you get a 10% XP buff. Otherwise, no new content has been added. As in year’s past, Coren’s trinket drop ilevel was increased. However, the ilevel increase, when the fest went live was, frankly, insulting to people who did the boss at his first availability. Trinkets were green quality and a 289 ilevel for level 120 players. In previous years, trinkets were purple quality and a base ilevel equal to something dropping from LFR raids. The community was not amused. Quickly, in the middle of the afternoon, Blizzard put in a hotfix, so trinkets are now ilevel 335. I got the coaster and can confirm it’s 335. If you’re struggling to get trinkets, this is an option. Plus, they are great for the alts you’re leveling to 120 as that trinket might not be replaced soon. To recap what’s available, in case you’ve forgotten, there are quite a number of achievements for doing simple things such as walking around the Brewfest grounds and eating one of everything. If you are still working towards the Violet Proto-Drake for “What a Long, Strange Trip It’s Been,” you’ll need to do all the Brewfest achievements. Brewfest garb is transmoggable during the holiday. I keep it in a separate bag in my bank because you never know when you might need a jaunty hat. 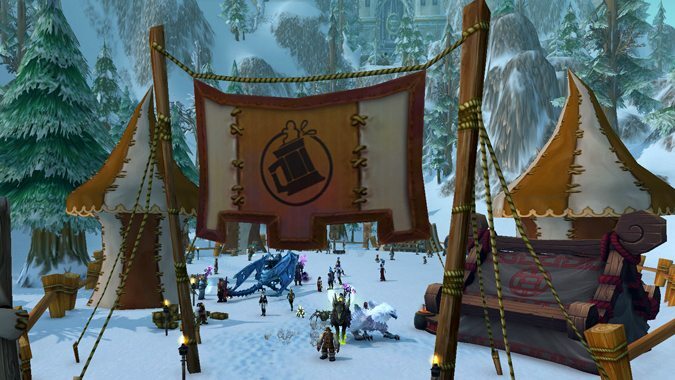 Pets, toys, and clothing requires Brewfest Prize Tokens to purchase. It’s a fun holiday and, now that the trinket issue has been fixed, if you’re looking for a quick upgrade for an alt, it’s easy to do. It runs from now through October 6th.